My extra blog for this week looks at the 1978 film by director Peter Hyams and starring Elliott Gould, Capricorn One. Spoilers ahead! 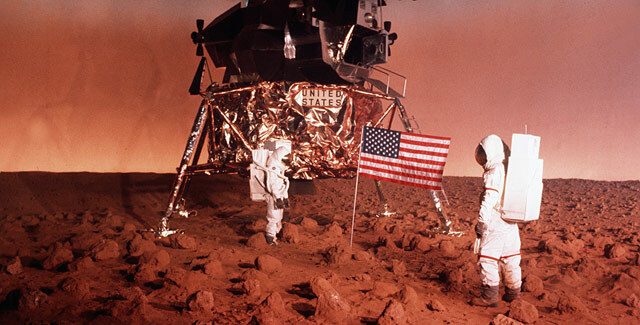 Capricorn One is a government conspiracy thriller based on an idea that the Apollo moon landings were faked, which I explored in a blog a couple of weeks ago. In this case, three astronauts are supposed to be part of the first manned mission to Mars. When NASA realises too late that the mission will fail, the astronauts are shipped off in secret to a film set and forced to fake the landing. However, reporter Robert Caulfield (Elliott Gould) senses that something is afoot and sets out to expose the conspiracy, thereby becoming the target of the conspirators. For a movie from 1978, I was impressed. I was expecting this kind of big production to be really dated, but it holds up well. The concept is great, and this film is credited with popularising the moon landing hoax theories, which continue to this day. Caulfield is a well-drawn character and there’s a ton of great dialogue, particularly Caulfield’s scenes with his boss, and his reporter friend, played by Karen Black. There’s a very suspenseful scene where the brakes on Caulfield’s car fail and it flies through busy streets at increasing speeds. There’s a POV of the car itself, unusual in scenes like this, and it’s hugely effective because it’s like you’re right there with him. It wasn’t perfect. A few scenes felt a bit truncated, like Caulfield being shot at in Flat Rock, while others were far too long. Several minutes could have been cut off the long scene of astronaut Willis wearily climbing a mountain in the desert and talking to himself, only to be captured at the top. 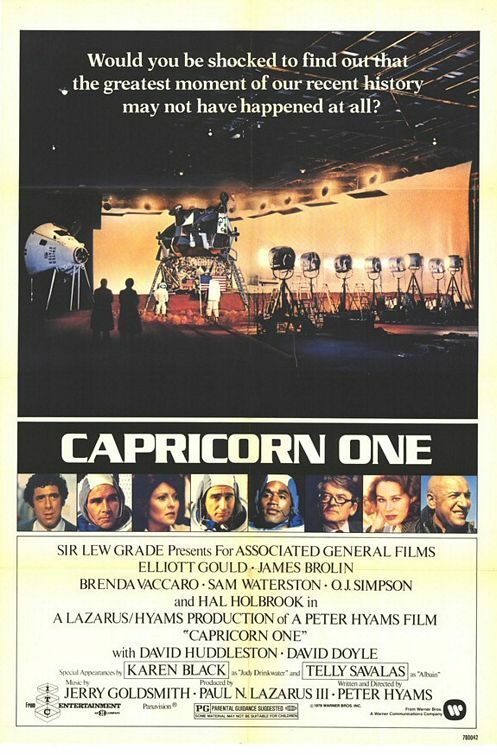 What I can’t help feeling is that Capricorn One would have been better as a TV miniseries. It was a two hour film, but that didn’t seem enough. Caulfield’s piecing together the conspiracy was good, but I wanted more focus on the faked footage itself. I presumed he might find some oddities and clues in the footage, which would lead him to the conclusion that it was faked. As it happened, it was a secret message in one of the astronauts’ conversations with his wife, and the disappearance of Caulfield’s friend, a NASA employee who was onto something, that sparked Caulfield’s investigation. Both good angles to take in this kind of conspiracy film, and the complete erasure of the NASA employee’s existence was eerie. But Hyams’ concept for the film came from the idea that “the only verification we have [for the Apollo moon missions] came from a TV camera”. My feeling is that to not have any focus on what the TV cameras showed was a bit of a squandered opportunity. More time would have been needed for this, and there wasn’t any. Arguably we could have done with less of the astronauts running around the desert and combating snakes, and more of Caulfield’s investigation. Or, like I say, perhaps it would’ve been better as a TV series. More time would also have allowed for a much more satisfying ending. The end scenes with Caulfield rescuing the only astronaut who hadn’t been captured by the ‘black helicopters’ were good. But it ends the moment the astronaut turns up at the memorial service, revealing the lie. We don’t get to see what happens next. Are all the conspirators rounded up? Does Caulfield find out what they did to his friend? Is NASA shut down? Overall, Capricorn One is a decent film with some well-developed characters, well-written dialogue, a great concept and a mostly good plot. Click here to read my analysis of the Apollo moon landing conspiracy theories. This Wednesday: Roswell, Part 4. In the meantime, take a look at Part 1, Part 2 and Part 3 of my investigation into the world’s most famous conspiracy theory.